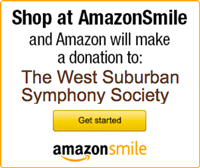 The West Suburban Symphony Society is committed to attracting diverse audiences to enjoy its concerts and providing talented musicians with equal opportunity to perform with its ensembles. The Society complies with all applicable nondiscrimination laws and does not tolerate sexual harassment. Does not discriminate against any individual on the basis of disability. Makes reasonable modifications in policies, practices, or procedures when such modifications are necessary to afford its goods, services, facilities, privileges, advantages, or accommodations to individuals with disabilities, unless the modifications would fundamentally alter the nature of its goods, services, facilities, privileges, advantages, or accommodations. Ensures that its selection process for orchestra and chorus members and guest performers does not tend to screen out, on the basis of their disabilities, individuals who otherwise meet the requirements for participation. If you have requests, questions, or concerns regarding nondiscrimination in the Society's activities, you are encouraged to contact the Society President. You are to describe the desired modification, or raise the question/concern, in a letter to President, West Suburban Symphony Society, P.O. Box 565, Hinsdale, IL 60522, and provide a phone number where you can be reached evenings and weekends. The President will call you within 30 days of the letter's postmark to discuss how the Society can best respond to the request, question, or concern. In addition, the President will send you a letter summarizing the discussions and describing any modifications made or actions taken in response to your letter.